Peripheral nerve tumors may be removable or diffusely invasive. The most common of the former type is the nerve sheath tumor, variously called perineurial fibroblastoma, neurilemmoma, or schwannoma. These tumors may displace a major portion of the nerve to one side and often can be totally or almost totally excised. They are found in patients with neurofibromatosis more often than in the general population. Rarely, these tumors may become malignant, metastasizing to other portions of the body and invading surrounding tissues. Schwannomas are typically benign tumors that arise from the supporting cells within a nerve. They usually arise from a single fascicle within a nerve, displacing the other fascicles. Symptoms occur when the tumor gets big enough to be felt through the skin or when pressure within the nerve causes pain, numbness, or weakness in the distribution of the parent nerve. Neurofibromas are characterized by general neoplastic activity within the nerve sheath. A wide spectrum of connective tissue and endoneurial cells intermixed with axons is seen histologically. These diffuse growths usually cannot be excised without resecting a segment of the involved nerve; at times they may spread in a plexiform fashion along all of a nerve’s branches. Neurofibromas are most often found in patients with neurofibromatosis. Nerve sheath tumors tend to be less than 1 mm in diameter but may become quite large—eg, to involve the entire sciatic nerve in the thigh. They may be excruciatingly painful even early in development or may become gigantic before being noted—especially, for example, when deep within an extremity or the abdomen. Growth activity is often associated with puberty. The symptoms of peripheral nerve tumors are those of peripheral nerve dysfunction, irritative or paralytic. The nature and distribution of this dysfunction show that it is related to a specific nerve rather than tracts in the spinal cord or brain. Sensory disturbances or muscular atrophy may be noted. Nerve conduction tests and precise electromyography may be of assistance. MRI with gadolinium will image the lesions. Peripheral neuropathies, including those that are the result of pressure (entrapment), may mimic peripheral nerve tumors, but a tumor that produces symptoms is usually large enough to be felt. Nerve tumors may occur anywhere along the course of the nerve, whereas entrapment occurs at characteristic locations. Generalized sensitivity along a nerve is more characteristic of neuritis than dysfunction caused by a primary nerve tumor. The operative approach to peripheral nerve tumors depends on the type of lesion. Schwannomas can almost always be removed with little permanent increase in the preoperative neurologic deficit. Typically, an operating microscope is used, and the lesion is separated from surrounding normal nerve fascicles. Complete resection is curative in these benign lesions. 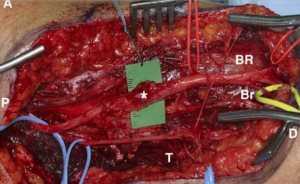 Amputation of the extremity may be necessary for an invasive malignant schwannoma unless it is so advanced that long-term survival is unlikely. Neurofibromas cannot usually be resected without loss of function in the parent nerve. For this reason, true neurofibromas should only be biopsied to ensure that they are not malignant and should be left in place unless the parent nerve can be sacrificed without producing significant neurologic deficit. In patients with neurofibromatosis, the growths are often multiple, so only the tumors that cause clinical signs and symptoms (eg, pain or sensorimotor loss) should be removed. In this disease, tumors not causing dysfunction should be left alone unless cosmetic deformity is substantial or they are subject to repeated trauma or irritation. Because most peripheral nerve tumors can be completely removed or are slowly growing lesions confined to a single nerve, the overall prognosis is good. However, moderate disability can be produced by unresectable lesions of major nerves. In addition, patients with neurofibromatosis may have multiple lesions, including those in the craniospinal axis, which can produce progressive and severe neurologic deficits. Malignant peripheral nerve tumors can be fatal if not treated in their early stages.